Where the hell is Shuri??? She's slated for one of the Avengers waves next year. They stated that back during SDCC. Is that the Civil War Black Panther? They coulda/shoulda put shuriin this wave insteada pink panther. 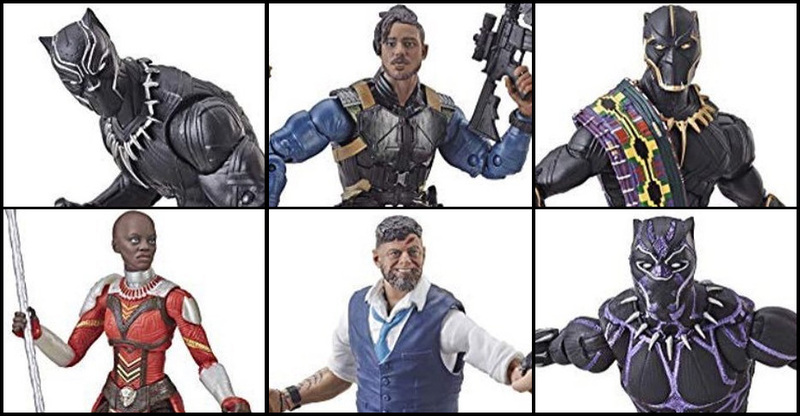 i only want purple panther, female soldier, mbaku and killmonger. is that regular BP a repaint? looks like the same mold from the last one? Yeah, seriously. Did we really need 3 Black Panthers in a 6 figures wave? That said, the set is still bought, because of M'Baku. Kind of disappointed that the 3 Dora Milaje heads look so similar...like the same woman with different expressions. This doesn't help my plight in the slightest..
Ooh, I like that to make up for the fact the Chadwick Boseman head we got with the first wave's T'Challa was so subpar, we're getting not one, but two new different Chadwick Boseman heads. And everything else, whew... this wave looks incredibly solid. The only things I think could be improved are 1) making the Dora Milaje figure's alternate heads more different looking so it'd be more effective as a troop builder, and 2) giving T'Chaka an unmasked Atandwa Kani head sculpt. Last edited by Jeddostotle7; 11-20-2018 at 02:00 PM..
Kinda annoyed because I have no real reason to re-buy the Civil War BP, but DAMN does that new Boseman head look great. Wish tchaka woulda had an unmasked head! 1/2 wave are simply bp repaints? Most of most waves are repaints. I’m kind of wondering how well J Jonah Jameson’s head would fit on Klaue’s body. dont understand why people are complaining about having multiple black panthers? there is already 100,000,000,000,000,000,000,000 spidermans, whats the difference? First off even if we were complaining, we also complain about the amount of spideys,Iron men, and caps that are stuffed in each wave all the time so idk what you're trying to insinuate. secondly no one is complaining. We're just stating we would rather have a figure of Shuri(who is a fan favorite and easily one of the highlights of that said film) in this wave then another figure of Black Panther. Last edited by Tim; 11-20-2018 at 09:03 PM..
dont understand why people are complaining about having multiple black panthers? Because they're both minor variations of two relatively recent releases. I get the annoyance. You mean hundred bazillion Deadpools... at least all the different Spideys sell for the most part and I think Spiderman is still the most popular comic book character in the world at the moment. I don't know why we need so many Deadpools... and lady Deadpool that nobody is buying... and Gwenpool... that nobody is buying... and that Symbiote Deadpool that nobody is buying. ...but they still need to do Kidpool and a Mercs for Money wave. Kids still get toys. Interest in the hero figure will always be paramount. As for the DM, they're all bald black women. I imagine it is going to be hard to differentiate the sculpts on a 6 inch toy. I can't wait for these. Every time I see that T'Chaka figure it makes me want a King Odin with his design from Thor and Thor: The Dark World. If Hasbro is going to go all out with these characters, that is a character we need down the road. I've build an extremely, EXTREMELY great MCU display, and it just keeps getting better and better. Keep them coming Hasbro.